The deceptively ordinary name ‘The Wall’ belies the wonder and diversity it represents: a highway for orcas, humpbacks and fin whales. Janie Wray writes about this special place. The Wall Islets, a cluster of tiny islands off the north coast of British Columbia, Canada, are home to an isolated research station run by CetaceaLab. I roll out of bed, grab my boots and reach for my camera. Two steps to the sliding door and then I am on the deck and suddenly very awake. A north-west wind chills me to the bone, but there is no time to go back for a sweater. Five humpback whales are surfacing together, only metres from shore. There is just enough light to take photos as they dive, massive tails lifted to the sky. They are gone as quickly as they appeared. This is the start to another day at the Wall Islets, a cluster of tiny islands in the middle of Caamano Sound off the north coast of British Columbia: our own Galapagos of the Great Whale Sea. Today I am the only human on this island; even the larger islands in the distance are uninhabited and rarely visited by people. In place of phones or the Internet, there is the sound of the ocean reaching for the shore. Through millennia the waves have smoothed the edges of this one big granite boulder that makes up the body of the islet. Just beyond the shoreline kelp beds trail dark golden fronds against the ebbing tide. Above me an eagle’s nest sits empty near the top of an ancient cedar tree. Leaves drip with dew that shines with life as the first rays of morning light start the day. I turn back into the cabin to get the coffee going. This small shelter perched on a cliff overlooking the sea is one of the research outposts built by the North Coast Cetacean Society (NCCS), a non-profit organisation dedicated to whale research and conservation. NCCS operates a main facility at CetaceaLab on Gil Island, at the mouth of Douglas Channel. We built this outpost to study the movement of orca and humpback whales that spend time here from May until late October. Years ago we had installed a hydrophone – an underwater microphone – in this isolated location to determine if we could record any presence of whales. We were in for the shock of our lives! We secured the hydrophone just offshore at a depth of 18 metres (60 feet) and threaded the cable up through the intertidal zone to a land-based transmitter. Back at CetaceaLab, we turned on the system and started listening. Soon we were recording a steady stream of humpback feeding and social calls. Unexpectedly, we also realised this area was an orca highway! Every day we heard the chatter of talkative orca pods. Clearly, there was a lot going on at the Wall. We decided to station an observer here to gain more insight. 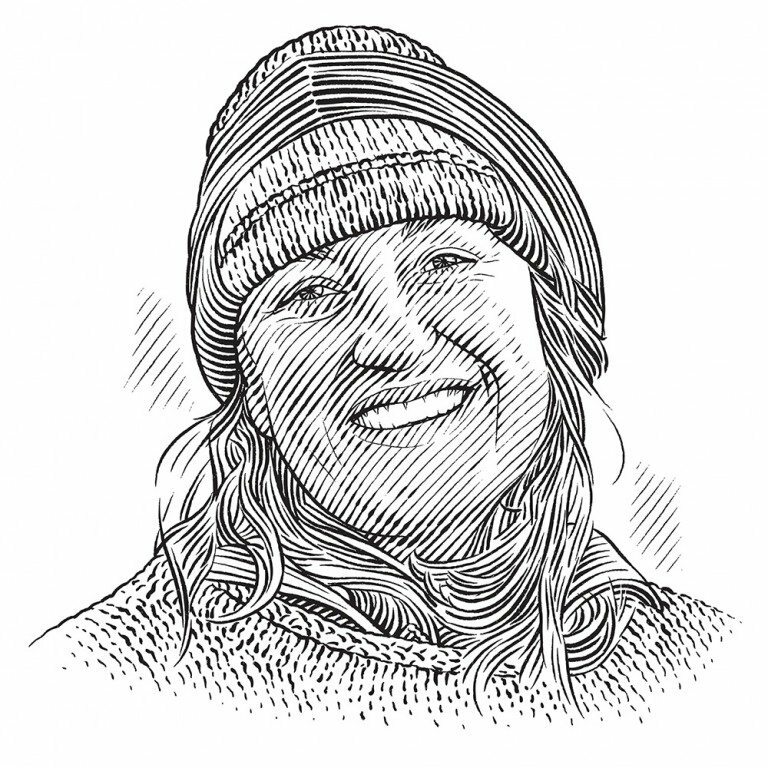 Having chosen a bluff that offered a 180-degree view over the open sea, we scoured nearby beaches for straight driftwood posts, strapped sheets of plywood to our boat and started building. The result is a simple one-room cabin with no plumbing and just enough power to charge a laptop. Equipped with a camp stove, a coffeepot and a massive pair of binoculars called ‘Big Eyes’ set up on a tripod, it was all we needed. Then the fin whales arrived. Fin whales are the second largest creatures on the planet, but they can be hard to detect, communicating at a frequency lower than the human hearing range so their calls often go unnoticed on hydrophone recordings. Once we had an observer at the Wall, we found that this is one of the few places where fin whales pass very close to shore. With humpbacks and fin whales returning in ever-greater numbers to the northern coast of British Columbia, it turned out that we had a front-row seat. For all these whale populations – northern resident and Bigg’s orcas, humpbacks and fins – this area of the British Columbia coast is vitally important habitat. The underwater soundscape is one of the quietest along the coast of North America, and these are some of the world’s most productive cold-water seas. It is an exceptional feeding, rearing and social space. It is also an unparalleled research setting. The narrow passage between the two Wall islets can be crossed on foot on low tide... expanding the world of the Wall Outpost inhabitants three-fold during a few hours every day. CetaceaLab’s 15-year history of year-round visual and acoustic data is the foundation of a growing number of research projects aimed at improving our understanding of cetacean ecology, behaviour, habitat use and social structures. The use of outposts like the Wall broadens our range and enriches our research by enabling us to track the movements of individuals and groups through the area. The Wall’s peaceful setting is a contrast to our growing anxiety about the future of this place and the well-being of the whales that depend on it. Development pressure is increasing on this wild coast, and the possibility of seeing hundreds of oil and gas tankers travelling these waters is very real. At CetaceaLab, we are racing against time to make the case that the Great Whale Sea needs protection. For now, however, the sense of urgency falls away as I settle into the day’s work. By 7 am I am looking for whales: methodical scans every 30 minutes, from one end of the horizon to the other. I keep a hand-held radio tuned to the hydrophone and my camera at hand. Before the day is over I have seen the short puffs of orca blows, heart-shaped plumes from humpbacks and the tall, pillar-shaped blows of fin whales. As the sun sinks into the ocean towards the west, a telltale ring of bubbles appears on the water nearby and the surface erupts with the enormous gaping mouths of feeding humpbacks. Further out, I can see the black dorsal fins of a small pod of orcas. Soon I will pull the Big Eyes into the cabin for the night. I am already looking forward to my bunk and to one of the greatest privileges I know: falling asleep in a tiny cabin on a windswept rock, suspended between a sky bright with stars and a sea alive with the calls of whales.